The staff of Only is thrilled to introduce Sylvie Odette Thomas, born March 7 2009, to Sarah Albertson and Adam O. Thomas. Now we know where babies come from. Holy cow, what a weird looking kid! :-> Congratulations, she’s adorable! 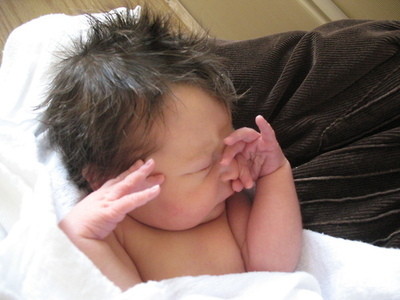 She’s already got the facepalm down pat.